This article is about the Sun and its planetary system. For other similar systems, see Planetary system. 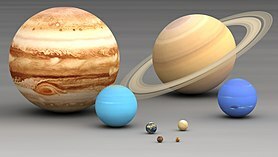 The Solar System also contains smaller objects. [e] The asteroid belt, which lies between the orbits of Mars and Jupiter, mostly contains objects composed, like the terrestrial planets, of rock and metal. 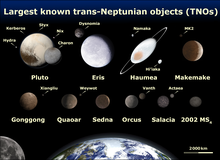 Beyond Neptune's orbit lie the Kuiper belt and scattered disc, which are populations of trans-Neptunian objects composed mostly of ices, and beyond them a newly discovered population of sednoids. Within these populations are several dozen to possibly tens of thousands of objects large enough that they have been rounded by their own gravity. Such objects are categorized as dwarf planets. Identified dwarf planets include the asteroid Ceres and the trans-Neptunian objects Pluto and Eris. [e] In addition to these two regions, various other small-body populations, including comets, centaurs and interplanetary dust clouds, freely travel between regions. Six of the planets, at least four of the dwarf planets, and many of the smaller bodies are orbited by natural satellites,[f] usually termed "moons" after the Moon. Each of the outer planets is encircled by planetary rings of dust and other small objects. In the 17th century, Galileo discovered that the Sun was marked with sunspots, and that Jupiter had four satellites in orbit around it. Christiaan Huygens followed on from Galileo's discoveries by discovering Saturn's moon Titan and the shape of the rings of Saturn. Edmond Halley realised in 1705 that repeated sightings of a comet were recording the same object, returning regularly once every 75–76 years. This was the first evidence that anything other than the planets orbited the Sun. Around this time (1704), the term "Solar System" first appeared in English. In 1838, Friedrich Bessel successfully measured a stellar parallax, an apparent shift in the position of a star created by Earth's motion around the Sun, providing the first direct, experimental proof of heliocentrism. Improvements in observational astronomy and the use of unmanned spacecraft have since enabled the detailed investigation of other bodies orbiting the Sun. The Solar System formed 4.568 billion years ago from the gravitational collapse of a region within a large molecular cloud. [h] This initial cloud was likely several light-years across and probably birthed several stars. As is typical of molecular clouds, this one consisted mostly of hydrogen, with some helium, and small amounts of heavier elements fused by previous generations of stars. As the region that would become the Solar System, known as the pre-solar nebula, collapsed, conservation of angular momentum caused it to rotate faster. The centre, where most of the mass collected, became increasingly hotter than the surrounding disc. As the contracting nebula rotated faster, it began to flatten into a protoplanetary disc with a diameter of roughly 200 AU and a hot, dense protostar at the centre. The planets formed by accretion from this disc, in which dust and gas gravitationally attracted each other, coalescing to form ever larger bodies. Hundreds of protoplanets may have existed in the early Solar System, but they either merged or were destroyed, leaving the planets, dwarf planets, and leftover minor bodies. The vast majority of the Solar System consists of a near-vacuum known as the interplanetary medium. Along with light, the Sun radiates a continuous stream of charged particles (a plasma) known as the solar wind. This stream of particles spreads outwards at roughly 1.5 million kilometres per hour, creating a tenuous atmosphere that permeates the interplanetary medium out to at least 100 AU (see § Heliosphere). Activity on the Sun's surface, such as solar flares and coronal mass ejections, disturbs the heliosphere, creating space weather and causing geomagnetic storms. The largest structure within the heliosphere is the heliospheric current sheet, a spiral form created by the actions of the Sun's rotating magnetic field on the interplanetary medium. Orrery showing the motions of the inner four planets. The small spheres represent the position of each planet on every Julian day, beginning July 6 2018 (aphelion) and ending January 3 2019 (perihelion). The four terrestrial or inner planets have dense, rocky compositions, few or no moons, and no ring systems. They are composed largely of refractory minerals, such as the silicates—which form their crusts and mantles—and metals, such as iron and nickel, which form their cores. Three of the four inner planets (Venus, Earth and Mars) have atmospheres substantial enough to generate weather; all have impact craters and tectonic surface features, such as rift valleys and volcanoes. The term inner planet should not be confused with inferior planet, which designates those planets that are closer to the Sun than Earth is (i.e. Mercury and Venus). Mercury (7010598391482800000♠0.4 AU from the Sun) is the closest planet to the Sun and on average, all seven other planets. The smallest planet in the Solar System (0.055 M⊕), Mercury has no natural satellites. Besides impact craters, its only known geological features are lobed ridges or rupes that were probably produced by a period of contraction early in its history. Mercury's very tenuous atmosphere consists of atoms blasted off its surface by the solar wind. Its relatively large iron core and thin mantle have not yet been adequately explained. Hypotheses include that its outer layers were stripped off by a giant impact, or that it was prevented from fully accreting by the young Sun's energy. 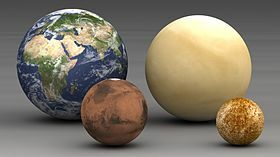 Venus (0.7 AU from the Sun) is close in size to Earth (0.815 M⊕) and, like Earth, has a thick silicate mantle around an iron core, a substantial atmosphere, and evidence of internal geological activity. It is much drier than Earth, and its atmosphere is ninety times as dense. Venus has no natural satellites. It is the hottest planet, with surface temperatures over 400 °C (752 °F), most likely due to the amount of greenhouse gases in the atmosphere. No definitive evidence of current geological activity has been detected on Venus, but it has no magnetic field that would prevent depletion of its substantial atmosphere, which suggests that its atmosphere is being replenished by volcanic eruptions. Mars (1.5 AU from the Sun) is smaller than Earth and Venus (0.107 M⊕). It has an atmosphere of mostly carbon dioxide with a surface pressure of 6.1 millibars (roughly 0.6% of that of Earth). Its surface, peppered with vast volcanoes, such as Olympus Mons, and rift valleys, such as Valles Marineris, shows geological activity that may have persisted until as recently as 2 million years ago. Its red colour comes from iron oxide (rust) in its soil. Mars has two tiny natural satellites (Deimos and Phobos) thought to be either captured asteroids, or ejected debris from a massive impact early in Mars's history. The donut-shaped asteroid belt is located between the orbits of Mars and Jupiter. Asteroids except for the largest, Ceres, are classified as small Solar System bodies[e] and are composed mainly of refractory rocky and metallic minerals, with some ice. They range from a few metres to hundreds of kilometres in size. Asteroids smaller than one meter are usually called meteoroids and micrometeoroids (grain-sized), depending on different, somewhat arbitrary definitions. The asteroid belt occupies the orbit between Mars and Jupiter, between 7011344075102610000♠2.3 and 3.3 AU from the Sun. It is thought to be remnants from the Solar System's formation that failed to coalesce because of the gravitational interference of Jupiter. The asteroid belt contains tens of thousands, possibly millions, of objects over one kilometre in diameter. Despite this, the total mass of the asteroid belt is unlikely to be more than a thousandth of that of Earth. The asteroid belt is very sparsely populated; spacecraft routinely pass through without incident. Ceres – map of gravity fields: red is high; blue, low. Ceres (2.77 AU) is the largest asteroid, a protoplanet, and a dwarf planet. [e] It has a diameter of slightly under 7006100000000000000♠1000 km, and a mass large enough for its own gravity to pull it into a spherical shape. Ceres was considered a planet when it was discovered in 1801, and was reclassified to asteroid in the 1850s as further observations revealed additional asteroids. It was classified as a dwarf planet in 2006 when the definition of a planet was created. Jupiter trojans are located in either of Jupiter's L4 or L5 points (gravitationally stable regions leading and trailing a planet in its orbit); the term trojan is also used for small bodies in any other planetary or satellite Lagrange point. Hilda asteroids are in a 2:3 resonance with Jupiter; that is, they go around the Sun three times for every two Jupiter orbits. The outer planets (in the background) Jupiter, Saturn, Uranus and Neptune, compared to the inner planets Earth, Venus, Mars and Mercury (in the foreground). Orrery showing the motions of the outer four planets. 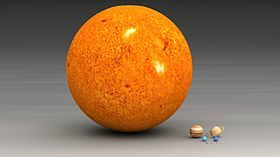 The small spheres represent the position of each planet on every 100 Julian days, beginning January 21 2023 (Jovian perihelion) and ending December 2 2034 (Jovian perihelion). The four outer planets, or giant planets (sometimes called Jovian planets), collectively make up 99% of the mass known to orbit the Sun. [g] Jupiter and Saturn are together more than 400 times the mass of Earth and consist overwhelmingly of hydrogen and helium. Uranus and Neptune are far less massive—less than 20 Earth masses (M⊕) each—and are composed primarily of ices. For these reasons, some astronomers suggest they belong in their own category, ice giants. All four giant planets have rings, although only Saturn's ring system is easily observed from Earth. The term superior planet designates planets outside Earth's orbit and thus includes both the outer planets and Mars. Jupiter (5.2 AU), at 318 M⊕, is 2.5 times the mass of all the other planets put together. It is composed largely of hydrogen and helium. Jupiter's strong internal heat creates semi-permanent features in its atmosphere, such as cloud bands and the Great Red Spot. Jupiter has 79 known satellites. The four largest, Ganymede, Callisto, Io, and Europa, show similarities to the terrestrial planets, such as volcanism and internal heating. Ganymede, the largest satellite in the Solar System, is larger than Mercury. Saturn (9.5 AU), distinguished by its extensive ring system, has several similarities to Jupiter, such as its atmospheric composition and magnetosphere. Although Saturn has 60% of Jupiter's volume, it is less than a third as massive, at 95 M⊕. Saturn is the only planet of the Solar System that is less dense than water. The rings of Saturn are made up of small ice and rock particles. Saturn has 62 confirmed satellites composed largely of ice. Two of these, Titan and Enceladus, show signs of geological activity. Titan, the second-largest moon in the Solar System, is larger than Mercury and the only satellite in the Solar System with a substantial atmosphere. Uranus (19.2 AU), at 14 M⊕, is the lightest of the outer planets. Uniquely among the planets, it orbits the Sun on its side; its axial tilt is over ninety degrees to the ecliptic. It has a much colder core than the other giant planets and radiates very little heat into space. Uranus has 27 known satellites, the largest ones being Titania, Oberon, Umbriel, Ariel, and Miranda. Neptune (7012450289590807000♠30.1 AU), though slightly smaller than Uranus, is more massive (17 M⊕) and hence more dense. It radiates more internal heat, but not as much as Jupiter or Saturn. Neptune has 14 known satellites. The largest, Triton, is geologically active, with geysers of liquid nitrogen. Triton is the only large satellite with a retrograde orbit. Neptune is accompanied in its orbit by several minor planets, termed Neptune trojans, that are in 1:1 resonance with it. 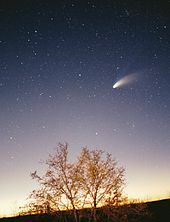 Comets are small Solar System bodies,[e] typically only a few kilometres across, composed largely of volatile ices. They have highly eccentric orbits, generally a perihelion within the orbits of the inner planets and an aphelion far beyond Pluto. When a comet enters the inner Solar System, its proximity to the Sun causes its icy surface to sublimate and ionise, creating a coma: a long tail of gas and dust often visible to the naked eye. Size comparison of some large TNOs with Earth: Pluto and its moons, Eris, Makemake, Haumea, Sedna, 2007 OR10, Quaoar, and Orcus. Beyond the heliosphere is the interstellar medium, consisting of various clouds of gases. The Solar System currently moves through the Local Interstellar Cloud. Compared to many other planetary systems, the Solar System stands out in lacking planets interior to the orbit of Mercury. The known Solar System also lacks super-Earths (Planet Nine could be a super-Earth beyond the known Solar System). Uncommonly, it has only small rocky planets and large gas giants; elsewhere planets of intermediate size are typical—both rocky and gas—so there is no "gap" as seen between the size of Earth and of Neptune (with a radius 3.8 times as large). Also, these super-Earths have closer orbits than Mercury. This led to hypothesis that all planetary systems start with many close-in planets, and that typically a sequence of their collisions causes consolidation of mass into few larger planets, but in case of the Solar System the collisions caused their destruction and ejection. ^ Capitalization of the name varies. The International Astronomical Union, the authoritative body regarding astronomical nomenclature, specifies capitalizing the names of all individual astronomical objects, but uses mixed "Solar System" and "solar system" in their naming guidelines document. The name is commonly rendered in lower case ("solar system"), as, for example, in the Oxford English Dictionary and Merriam-Webster's 11th Collegiate Dictionary. ^ The natural satellites (moons) orbiting the Solar System's planets are an example of the latter. ^ Historically, several other bodies were once considered planets, including, from its discovery in 1930 until 2006, Pluto. See Former planets. ^ The two moons larger than Mercury are Ganymede, which orbits Jupiter, and Titan, which orbits Saturn. Although bigger than Mercury, both moons have less than half the mass of Mercury. ^ a b c d e According to IAU definitions, objects orbiting the Sun are classified dynamically and physically into three categories: planets, dwarf planets, and small Solar System bodies. ^ a b The mass of the Solar System excluding the Sun, Jupiter and Saturn can be determined by adding together all the calculated masses for its largest objects and using rough calculations for the masses of the Oort cloud (estimated at roughly 3 Earth masses), the Kuiper belt (estimated at roughly 0.1 Earth mass) and the asteroid belt (estimated to be 0.0005 Earth mass) for a total, rounded upwards, of ~37 Earth masses, or 8.1% of the mass in orbit around the Sun. With the combined masses of Uranus and Neptune (~31 Earth masses) subtracted, the remaining ~6 Earth masses of material comprise 1.3% of the total orbiting mass. = 18h 0m 00 are those for the north pole of the ecliptic. (Both pairs of coordinates are for J2000 epoch.) The result of the calculation is 60.19°. ^ Mike Brown (23 August 2011). "Free the dwarf planets!". Mike Brown's Planets. ^ "How Many Solar System Bodies". NASA/JPL Solar System Dynamics. Retrieved 20 April 2018. ^ Wm. Robert Johnston (12 April 2018). "Asteroids with Satellites". Johnston's Archive. Retrieved 20 April 2018. ^ a b "Latest Published Data". The International Astronomical Union Minor Planet Center. Retrieved 21 May 2018. ^ a b Mumma, M.J.; Disanti, M.A. ; Dello Russo, N.; Magee-Sauer, K.; Gibb, E.; Novak, R. (2003). "Remote infrared observations of parent volatiles in comets: A window on the early solar system". Advances in Space Research. 31 (12): 2563–2575. Bibcode:2003AdSpR..31.2563M. CiteSeerX 10.1.1.575.5091. doi:10.1016/S0273-1177(03)00578-7. ^ a b c "The Final IAU Resolution on the definition of "planet" ready for voting". IAU. 24 August 2006. Archived from the original on 7 January 2009. Retrieved 2 March 2007. 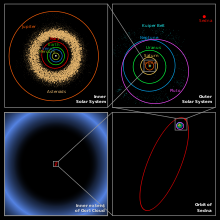 ^ a b "Dwarf Planets and their Systems". Working Group for Planetary System Nomenclature (WGPSN). U.S. Geological Survey. 7 November 2008. Retrieved 13 July 2008. ^ Ron Ekers. "IAU Planet Definition Committee". International Astronomical Union. Archived from the original on 3 June 2009. Retrieved 13 October 2008. ^ "Plutoid chosen as name for Solar System objects like Pluto". International Astronomical Union, Paris. 11 June 2008. Archived from the original on 13 June 2008. Retrieved 11 June 2008. ^ WC Rufus (1923). "The astronomical system of Copernicus". Popular Astronomy. Vol. 31. p. 510. Bibcode:1923PA.....31..510R. ^ Eric W. Weisstein (2006). "Galileo Galilei (1564–1642)". Wolfram Research. Retrieved 2010-10-27. ^ "Discoverer of Titan: Christiaan Huygens". ESA Space Science. 2005. Retrieved 2010-10-27. ^ "Comet Halley". University of Tennessee. Retrieved 2006-12-27. ^ "Etymonline: Solar System". Retrieved 2008-01-24. ^ "1838: Friedrich Bessel Measures Distance to a Star". Observatories of the Carnegie Institution for Science. Retrieved 2018-09-22. ^ M Woolfson (2000). "The origin and evolution of the solar system". Astronomy & Geophysics. 41 (1): 1.12–1.19. Bibcode:2000A&G....41a..12W. doi:10.1046/j.1468-4004.2000.00012.x. ^ Alessandro Morbidelli (2005). "Origin and dynamical evolution of comets and their reservoirs". arXiv:astro-ph/0512256. ^ a b Audrey Delsanti & David Jewitt (2006). "The Solar System Beyond The Planets" (PDF). Institute for Astronomy, University of Hawaii. Archived from the original (PDF) on 29 January 2007. Retrieved 3 January 2007. ^ a b Krasinsky, G.A. ; Pitjeva, E.V. ; Vasilyev, M.V. ; Yagudina, E.I. (July 2002). "Hidden Mass in the Asteroid Belt". Icarus. 158 (1): 98–105. Bibcode:2002Icar..158...98K. doi:10.1006/icar.2002.6837. ^ Levison, H.F.; Morbidelli, A. (27 November 2003). "The formation of the Kuiper belt by the outward transport of bodies during Neptune's migration". Nature. 426 (6965): 419–421. Bibcode:2003Natur.426..419L. doi:10.1038/nature02120. PMID 14647375. ^ Harold F. Levison; Martin J Duncan (1997). "From the Kuiper Belt to Jupiter-Family Comets: The Spatial Distribution of Ecliptic Comets". Icarus. 127 (1): 13–32. Bibcode:1997Icar..127...13L. doi:10.1006/icar.1996.5637. ^ Grossman, Lisa (13 August 2009). "Planet found orbiting its star backwards for first time". New Scientist. Retrieved 10 October 2009. ^ "The Solar System". Nine Planets. Retrieved 15 February 2007. ^ Amir Alexander (2006). "New Horizons Set to Launch on 9-Year Voyage to Pluto and the Kuiper Belt". The Planetary Society. Archived from the original on 22 February 2006. Retrieved 8 November 2006. ^ a b Marochnik, L. & Mukhin, L. (1995). "Is Solar System Evolution Cometary Dominated?". In Shostak, G.S. Progress in the Search for Extraterrestrial Life. Astronomical Society of the Pacific Conference Series. 74. p. 83. Bibcode:1995ASPC...74...83M. ISBN 0-937707-93-7. ^ Bi, S.L. ; Li, T.D. ; Li, L.H. ; Yang, W.M. (2011). "Solar Models with Revised Abundance". The Astrophysical Journal. 731 (2): L42. arXiv:1104.1032. Bibcode:2011ApJ...731L..42B. doi:10.1088/2041-8205/731/2/L42. ^ "The Sun's Vital Statistics". Stanford Solar Center. Retrieved 29 July 2008. , citing Eddy, J. (1979). A New Sun: The Solar Results From Skylab. NASA. p. 37. NASA SP-402. ^ Williams, David R. (7 September 2006). "Saturn Fact Sheet". NASA. Archived from the original on 21 August 2011. Retrieved 31 July 2007. ^ Williams, David R. (16 November 2004). "Jupiter Fact Sheet". NASA. Archived from the original on 5 October 2011. Retrieved 8 August 2007. ^ Paul Robert Weissman; Torrence V. Johnson (2007). Encyclopedia of the solar system. Academic Press. p. 615. ISBN 978-0-12-088589-3. ^ a b c Podolak, M.; Weizman, A.; Marley, M. (December 1995). "Comparative models of Uranus and Neptune". Planetary and Space Science. 43 (12): 1517–1522. Bibcode:1995P&SS...43.1517P. doi:10.1016/0032-0633(95)00061-5. ^ a b c d Podolak, M.; Podolak, J.I. ; Marley, M.S. (February 2000). "Further investigations of random models of Uranus and Neptune". Planetary and Space Science. 48 (2–3): 143–151. Bibcode:2000P&SS...48..143P. doi:10.1016/S0032-0633(99)00088-4. ^ Michael Zellik (2002). Astronomy: The Evolving Universe (9th ed.). Cambridge University Press. p. 240. ISBN 978-0-521-80090-7. OCLC 223304585. ^ Placxo, Kevin W.; Gross, Michael (2006). Astrobiology: a brief introduction. JHU Press. p. 66. ISBN 978-0-8018-8367-5. ^ "Dawn: A Journey to the Beginning of the Solar System". Space Physics Center: UCLA. 2005. Archived from the original on 24 May 2012. Retrieved 3 November 2007. ^ Guy Ottewell (1989). "The Thousand-Yard Model |subtitle Earth as a Peppercorn". NOAO Educational Outreach Office. Retrieved 10 May 2012. ^ "Tours of Model Solar Systems". University of Illinois. Archived from the original on 12 April 2011. Retrieved 10 May 2012. ^ "Luleå är Sedna. I alla fall om vår sol motsvaras av Globen i Stockholm". Norrbotten Kuriren (in Swedish). Archived from the original on 15 July 2010. Retrieved 10 May 2010. ^ See, for example, Office of Space Science (9 July 2004). "Solar System Scale". NASA Educator Features. Retrieved 2 April 2013. ^ Bouvier, A.; Wadhwa, M. (2010). "The age of the Solar System redefined by the oldest Pb–Pb age of a meteoritic inclusion". Nature Geoscience. 3 (9): 637–641. Bibcode:2010NatGe...3..637B. doi:10.1038/NGEO941. ^ a b c "Lecture 13: The Nebular Theory of the origin of the Solar System". University of Arizona. Retrieved 27 December 2006. ^ Irvine, W.M. (1983). "The chemical composition of the pre-solar nebula". Cometary exploration; Proceedings of the International Conference. 1. p. 3. Bibcode:1983coex....1....3I. ^ Greaves, Jane S. (7 January 2005). "Disks Around Stars and the Growth of Planetary Systems". Science. 307 (5706): 68–71. Bibcode:2005Sci...307...68G. doi:10.1126/science.1101979. PMID 15637266. ^ Present Understanding of the Origin of Planetary Systems. National Academy of Sciences. 5 April 2000. Retrieved 19 January 2007. ^ Boss, A.P. ; Durisen, R.H. (2005). "Chondrule-forming Shock Fronts in the Solar Nebula: A Possible Unified Scenario for Planet and Chondrite Formation". The Astrophysical Journal. 621 (2): L137. arXiv:astro-ph/0501592. Bibcode:2005ApJ...621L.137B. doi:10.1086/429160. ^ Sukyoung Yi; Pierre Demarque; Yong-Cheol Kim; Young-Wook Lee; Chang H. Ree; Thibault Lejeune; Sydney Barnes (2001). "Toward Better Age Estimates for Stellar Populations: The Y2 Isochrones for Solar Mixture". Astrophysical Journal Supplement. 136 (2): 417–437. arXiv:astro-ph/0104292. Bibcode:2001ApJS..136..417Y. doi:10.1086/321795. ^ A. Chrysostomou; P.W. Lucas (2005). "The Formation of Stars". Contemporary Physics. 46 (1): 29–40. Bibcode:2005ConPh..46...29C. doi:10.1080/0010751042000275277. ^ a b Schröder, K.-P.; Connon Smith, Robert (May 2008). "Distant future of the Sun and Earth revisited". Monthly Notices of the Royal Astronomical Society. 386 (1): 155–163. arXiv:0801.4031. Bibcode:2008MNRAS.386..155S. doi:10.1111/j.1365-2966.2008.13022.x. ^ Nir J. Shaviv (2003). "Towards a Solution to the Early Faint Sun Paradox: A Lower Cosmic Ray Flux from a Stronger Solar Wind". Journal of Geophysical Research. 108 (A12): 1437. arXiv:astroph/0306477. Bibcode:2003JGRA..108.1437S. doi:10.1029/2003JA009997. ^ Pogge, Richard W. (1997). "The Once & Future Sun". New Vistas in Astronomy. Archived from the original on 27 May 2005. Retrieved 7 December 2005. ^ "Sun: Facts & Figures". NASA. Archived from the original on 2 January 2008. Retrieved 14 May 2009. ^ Zirker, Jack B. (2002). Journey from the Center of the Sun. Princeton University Press. pp. 120–127. ISBN 978-0-691-05781-1. ^ "Why is visible light visible, but not other parts of the spectrum?". The Straight Dome. 2003. Retrieved 14 May 2009. ^ Than, Ker (30 January 2006). "Astronomers Had it Wrong: Most Stars are Single". SPACE.com. Retrieved 1 August 2007. ^ Smart, R. L.; Carollo, D.; Lattanzi, M. G.; McLean, B.; Spagna, A. (2001). "The Second Guide Star Catalogue and Cool Stars". In Hugh R.A. Jones; Iain A. Steele. Ultracool Dwarfs: New Spectral Types L and T. Springer. p. 119. Bibcode:2001udns.conf..119S. ^ T.S. van Albada; Norman Baker (1973). "On the Two Oosterhoff Groups of Globular Clusters". The Astrophysical Journal. 185: 477–498. Bibcode:1973ApJ...185..477V. doi:10.1086/152434. ^ Charles H. Lineweaver (9 March 2001). "An Estimate of the Age Distribution of Terrestrial Planets in the Universe: Quantifying Metallicity as a Selection Effect". Icarus. 151 (2): 307–313. arXiv:astro-ph/0012399. Bibcode:2001Icar..151..307L. CiteSeerX 10.1.1.254.7940. doi:10.1006/icar.2001.6607. ^ "Solar Physics: The Solar Wind". Marshall Space Flight Center. 16 July 2006. Retrieved 3 October 2006. ^ a b c "Voyager Enters Solar System's Final Frontier". NASA. Retrieved 2 April 2007. ^ Phillips, Tony (15 February 2001). "The Sun Does a Flip". NASA–Science News. Archived from the original on 12 May 2009. Retrieved 4 February 2007. ^ "A Star with two North Poles". NASA–Science News. 22 April 2003. Archived from the original on 18 July 2009. ^ Riley, Pete (2002). "Modeling the heliospheric current sheet: Solar cycle variations" (PDF). Journal of Geophysical Research. 107. Bibcode:2002JGRA.107g.SSH8R. doi:10.1029/2001JA000299. Archived from the original (PDF) on 14 August 2009. ^ "Solar Wind blows some of Earth's atmosphere into space". Science@NASA Headline News. 8 December 1998. ^ Lundin, Richard (9 March 2001). "Erosion by the Solar Wind". Science. 291 (5510): 1909. doi:10.1126/science.1059763. PMID 11245195. ^ Langner, U.W. ; M.S. Potgieter (2005). "Effects of the position of the solar wind termination shock and the heliopause on the heliospheric modulation of cosmic rays". Advances in Space Research. 35 (12): 2084–2090. Bibcode:2005AdSpR..35.2084L. doi:10.1016/j.asr.2004.12.005. ^ "Long-term Evolution of the Zodiacal Cloud". 1998. Archived from the original on 29 September 2006. Retrieved 3 February 2007. 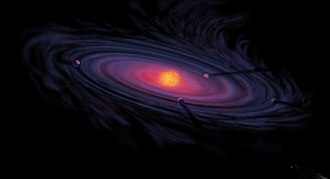 ^ "ESA scientist discovers a way to shortlist stars that might have planets". ESA Science and Technology. 2003. Retrieved 3 February 2007. ^ Landgraf, M.; Liou, J.-C.; Zook, H.A. ; Grün, E. (May 2002). "Origins of Solar System Dust beyond Jupiter" (PDF). The Astronomical Journal. 123 (5): 2857–2861. arXiv:astro-ph/0201291. Bibcode:2002AJ....123.2857L. doi:10.1086/339704. Retrieved 9 February 2007. ^ "Inner Solar System". NASA Science (Planets). Archived from the original on 11 May 2009. Retrieved 9 May 2009. ^ "Frost line or snow line or ice line in the solar system". Astronoo. Retrieved 28 November 2017. ^ Ryan Whitwam (March 18, 2019). "Mercury Is Actually the Closest Planet to Every Other Planet". ExtremeTech.com. Retrieved 25 March 2019. ^ Bill Arnett (2006). "Mercury". Nine Planets. Retrieved 14 September 2006. ^ Benz, W.; Slattery, W.L. ; Cameron, A.G.W. (1988). "Collisional stripping of Mercury's mantle". Icarus (Submitted manuscript). 74 (3): 516–528. Bibcode:1988Icar...74..516B. doi:10.1016/0019-1035(88)90118-2. ^ Cameron, A.G.W. (1985). "The partial volatilization of Mercury". Icarus. 64 (2): 285–294. Bibcode:1985Icar...64..285C. doi:10.1016/0019-1035(85)90091-0. ^ Mark Alan Bullock (1997). "The Stability of Climate on Venus" (PDF). Southwest Research Institute. Archived from the original (PDF) on 14 June 2007. Retrieved 26 December 2006. ^ Paul Rincon (1999). "Climate Change as a Regulator of Tectonics on Venus" (PDF). Johnson Space Center Houston, TX, Institute of Meteoritics, University of New Mexico, Albuquerque, NM. Archived from the original (PDF) on 14 June 2007. Retrieved 19 November 2006. ^ "What are the characteristics of the Solar System that lead to the origins of life?". NASA Science (Big Questions). Retrieved 30 August 2011. ^ Anne E. Egger. "Earth's Atmosphere: Composition and Structure". VisionLearning.com. Retrieved 26 December 2006. ^ David C. Gatling; Conway Leovy (2007). "Mars Atmosphere: History and Surface Interactions". In Lucy-Ann McFadden; et al. Encyclopaedia of the Solar System. pp. 301–314. ^ David Noever (2004). "Modern Martian Marvels: Volcanoes?". NASA Astrobiology Magazine. Retrieved 23 July 2006. ^ "Mars: A Kid's Eye View". NASA. Retrieved 14 May 2009. ^ Scott S. Sheppard; David Jewitt & Jan Kleyna (2004). "A Survey for Outer Satellites of Mars: Limits to Completeness" (PDF). Astronomical Journal. Retrieved 26 December 2006. ^ Pascal Rosenblatt; Sébastien Charnoz; Kevin M. Dunseath; Mariko Terao-Dunseath; Antony Trinh; Ryuki Hyodo; Hidenori Genda; Stéven Toupin (2016). "Accretion of Phobos and Deimos in an extended debris disc stirred by transient moons". Nature Geoscience. 9 (8): 581. Bibcode:2016NatGe...9..581R. doi:10.1038/ngeo2742. ^ "IAU Planet Definition Committee". International Astronomical Union. 2006. Archived from the original on 3 June 2009. Retrieved 1 March 2009. 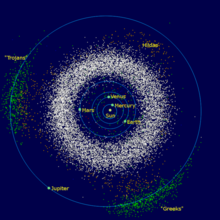 ^ "Are Kuiper Belt Objects asteroids? Are large Kuiper Belt Objects planets?". Cornell University. Archived from the original on 3 January 2009. Retrieved 1 March 2009. ^ Petit, J.-M.; Morbidelli, A.; Chambers, J. (2001). "The Primordial Excitation and Clearing of the Asteroid Belt" (PDF). Icarus. 153 (2): 338–347. Bibcode:2001Icar..153..338P. doi:10.1006/icar.2001.6702. Retrieved 22 March 2007. ^ "New study reveals twice as many asteroids as previously believed". ESA. 2002. Retrieved 23 June 2006. ^ "History and Discovery of Asteroids" (DOC). NASA. Retrieved 29 August 2006. ^ Phil Berardelli (2006). "Main-Belt Comets May Have Been Source of Earths Water". SpaceDaily. Retrieved 23 June 2006. ^ Barucci, M. A.; Kruikshank, D.P. ; Mottola S.; Lazzarin M. (2002). "Physical Properties of Trojan and Centaur Asteroids". Asteroids III. Tucson, Arizona: University of Arizona Press. pp. 273–87. ^ Morbidelli, A.; Bottke, W.F. ; Froeschlé, Ch. ; Michel, P. (January 2002). W.F. Bottke Jr.; A. Cellino; P. Paolicchi; R.P. Binzel, eds. "Origin and Evolution of Near-Earth Objects" (PDF). Asteroids III: 409–422. Bibcode:2002aste.book..409M. ^ Jack J. Lissauer; David J. Stevenson (2006). "Formation of Giant Planets" (PDF). NASA Ames Research Center; California Institute of Technology. Archived from the original (PDF) on 26 March 2009. Retrieved 16 January 2006. ^ Pappalardo, R T (1999). "Geology of the Icy Galilean Satellites: A Framework for Compositional Studies". Brown University. Archived from the original on 30 September 2007. Retrieved 16 January 2006. ^ Kargel, J.S. (1994). "Cryovolcanism on the icy satellites". Earth, Moon, and Planets (Submitted manuscript). 67 (1–3): 101–113. Bibcode:1995EM&P...67..101K. doi:10.1007/BF00613296. ^ Hawksett, David; Longstaff, Alan; Cooper, Keith; Clark, Stuart (2005). "10 Mysteries of the Solar System". Astronomy Now. 19 (8): 65. Bibcode:2005AsNow..19h..65H. ^ Podolak, M.; Reynolds, R.T.; Young, R. (1990). "Post Voyager comparisons of the interiors of Uranus and Neptune". Geophysical Research Letters (Submitted manuscript). 17 (10): 1737–1740. Bibcode:1990GeoRL..17.1737P. doi:10.1029/GL017i010p01737. ^ Duxbury, N.S. ; Brown, R.H. (1995). "The Plausibility of Boiling Geysers on Triton". Beacon eSpace. Archived from the original on 26 April 2009. Retrieved 16 January 2006. ^ John Stansberry; Will Grundy; Mike Brown; Dale Cruikshank; John Spencer; David Trilling; Jean-Luc Margot (2007). "Physical Properties of Kuiper Belt and Centaur Objects: Constraints from Spitzer Space Telescope". The Solar System Beyond Neptune. p. 161. arXiv:astro-ph/0702538. Bibcode:2008ssbn.book..161S. ^ Patrick Vanouplines (1995). "Chiron biography". Vrije Universitiet Brussel. Archived from the original on 2 May 2009. Retrieved 23 June 2006. ^ Sekanina, Zdeněk (2001). "Kreutz sungrazers: the ultimate case of cometary fragmentation and disintegration?". Publications of the Astronomical Institute of the Academy of Sciences of the Czech Republic. 89: 78–93. Bibcode:2001PAICz..89...78S. ^ Królikowska, M. (2001). "A study of the original orbits of hyperbolic comets". Astronomy & Astrophysics. 376 (1): 316–324. Bibcode:2001A&A...376..316K. doi:10.1051/0004-6361:20010945. ^ Whipple, Fred L. (1992). "The activities of comets related to their aging and origin". Celestial Mechanics and Dynamical Astronomy. 54 (1–3): 1–11. Bibcode:1992CeMDA..54....1W. doi:10.1007/BF00049540. ^ Alan Stern (February 2015). "Journey to the Solar System's Third Zone". American Scientist. Retrieved 26 October 2018. ^ a b Stephen C. Tegler (2007). "Kuiper Belt Objects: Physical Studies". In Lucy-Ann McFadden; et al. Encyclopedia of the Solar System. pp. 605–620. ^ Brown, M.E. ; Van Dam, M.A. ; Bouchez, A.H.; Le Mignant, D.; Campbell, R.D. ; Chin, J.C.Y. ; Conrad, A.; Hartman, S.K. ; Johansson, E.M.; Lafon, R.E. ; Rabinowitz, D.L. Rabinowitz; Stomski, P.J., Jr.; Summers, D.M. ; Trujillo, C.A. ; Wizinowich, P.L. (2006). "Satellites of the Largest Kuiper Belt Objects" (PDF). The Astrophysical Journal. 639 (1): L43–L46. arXiv:astro-ph/0510029. Bibcode:2006ApJ...639L..43B. doi:10.1086/501524. Retrieved 19 October 2011. ^ Chiang, E.I. ; Jordan, A.B. ; Millis, R.L. ; Buie, M.W. ; Wasserman, L.H. ; Elliot, J.L. ; Kern, S.D. ; Trilling, D.E. ; Meech, K.J. ; et al. (2003). "Resonance Occupation in the Kuiper Belt: Case Examples of the 5:2 and Trojan Resonances" (PDF). The Astronomical Journal. 126 (1): 430–443. arXiv:astro-ph/0301458. Bibcode:2003AJ....126..430C. doi:10.1086/375207. Retrieved 15 August 2009. ^ M.W. Buie; R.L. Millis; L. H. Wasserman; J.L. Elliot; S.D. Kern; K.B. Clancy; E.I. Chiang; A.B. Jordan; K.J. Meech; R.M. Wagner; D.E. Trilling (2005). "Procedures, Resources and Selected Results of the Deep Ecliptic Survey". Earth, Moon, and Planets. 92 (1): 113–124. arXiv:astro-ph/0309251. Bibcode:2003EM&P...92..113B. doi:10.1023/B:MOON.0000031930.13823.be. ^ E. Dotto1; M. A. Barucci2; M. Fulchignoni (24 August 2006). "Beyond Neptune, the new frontier of the Solar System" (PDF). Retrieved 26 December 2006. ^ Fajans, J.; L. Frièdland (October 2001). "Autoresonant (nonstationary) excitation of pendulums, Plutinos, plasmas, and other nonlinear oscillators" (PDF). American Journal of Physics. 69 (10): 1096–1102. Bibcode:2001AmJPh..69.1096F. doi:10.1119/1.1389278. Archived from the original (PDF) on 7 June 2011. Retrieved 26 December 2006. ^ Marc W. Buie (5 April 2008). "Orbit Fit and Astrometric record for 136472". SwRI (Space Science Department). Retrieved 15 July 2012. ^ Michael E. Brown. "The largest Kuiper belt objects" (PDF). Caltech. Retrieved 15 July 2012. ^ "News Release – IAU0807: IAU names fifth dwarf planet Haumea". International Astronomical Union. 17 September 2008. Retrieved 15 July 2012. ^ David Jewitt (2005). "The 1000 km Scale KBOs". University of Hawaii. Retrieved 16 July 2006. ^ "List of Centaurs and Scattered-Disk Objects". IAU: Minor Planet Center. Retrieved 2 April 2007. ^ a b c Fahr, H. J.; Kausch, T.; Scherer, H. (2000). "A 5-fluid hydrodynamic approach to model the Solar System-interstellar medium interaction" (PDF). Astronomy & Astrophysics. 357: 268. Bibcode:2000A&A...357..268F. See Figures 1 and 2. 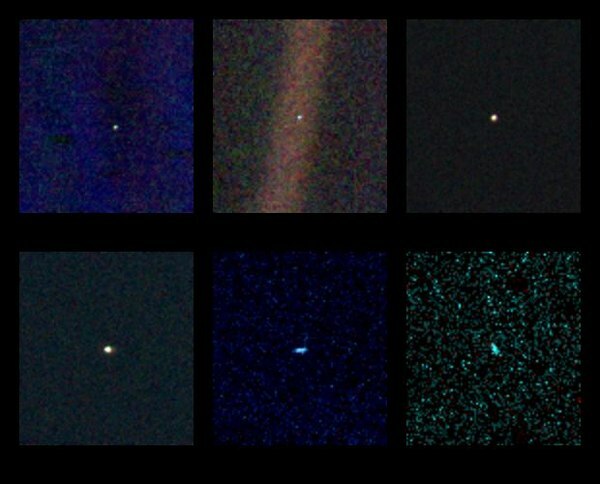 ^ "Cassini's Big Sky: The View from the Center of Our Solar System". NASA/JPL. 2009. Retrieved 20 December 2009. ^ Stone, E.C. ; Cummings, A.C.; McDonald, F.B. ; Heikkila, B.C. ; Lal, N.; Webber, W.R. (September 2005). "Voyager 1 explores the termination shock region and the heliosheath beyond". Science. 309 (5743): 2017–20. Bibcode:2005Sci...309.2017S. doi:10.1126/science.1117684. PMID 16179468. ^ Stone, E.C. ; Cummings, A.C.; McDonald, F.B. ; Heikkila, B.C. ; Lal, N.; Webber, W.R. (July 2008). "An asymmetric solar wind termination shock". Nature. 454 (7200): 71–4. Bibcode:2008Natur.454...71S. doi:10.1038/nature07022. PMID 18596802. ^ Cook, Jia-Rui C.; Agle, D. C.; Brown, Dwayne (12 September 2013). "NASA Spacecraft Embarks on Historic Journey into Interstellar Space". NASA. Retrieved 12 September 2013. ^ Nemiroff, R.; Bonnell, J., eds. (24 June 2002). "The Sun's Heliosphere & Heliopause". Astronomy Picture of the Day. NASA. Retrieved 23 June 2006. ^ "Voyager: Interstellar Mission". NASA Jet Propulsion Laboratory. 2007. Retrieved 8 May 2008. ^ R. L. McNutt, Jr.; et al. (2006). "Innovative Interstellar Explorer". 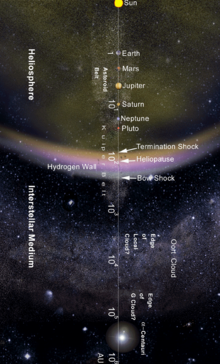 Physics of the Inner Heliosheath: Voyager Observations, Theory, and Future Prospects. AIP Conference Proceedings. 858. pp. 341–347. Bibcode:2006AIPC..858..341M. doi:10.1063/1.2359348. ^ Anderson, Mark (5 January 2007). "Interstellar space, and step on it!". New Scientist. Retrieved 5 February 2007. ^ David Jewitt (2004). "Sedna – 2003 VB12". University of Hawaii. Retrieved 23 June 2006. ^ Mike Brown (2004). "Sedna". Caltech. Retrieved 2 May 2007. ^ "JPL Small-Body Database Browser: (2012 VP113)" (2013-10-30 last obs). Jet Propulsion Laboratory. Retrieved 26 March 2014. ^ Stern SA, Weissman PR (2001). "Rapid collisional evolution of comets during the formation of the Oort cloud". Nature. 409 (6820): 589–591. doi:10.1038/35054508. PMID 11214311. ^ Bill Arnett (2006). 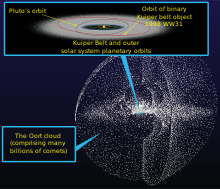 "The Kuiper Belt and the Oort Cloud". Nine Planets. Retrieved 23 June 2006. ^ Durda D.D. ; Stern S.A.; Colwell W.B. ; Parker J.W. ; Levison H.F.; Hassler D.M. (2004). "A New Observational Search for Vulcanoids in SOHO/LASCO Coronagraph Images". Icarus. 148 (1): 312–315. Bibcode:2000Icar..148..312D. doi:10.1006/icar.2000.6520. ^ R. Drimmel; D.N. Spergel (2001). 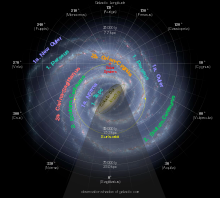 "Three Dimensional Structure of the Milky Way Disk". The Astrophysical Journal. 556 (1): 181–202. arXiv:astro-ph/0101259. Bibcode:2001ApJ...556..181D. doi:10.1086/321556. ^ Eisenhauer, F.; et al. (2003). "A Geometric Determination of the Distance to the Galactic Center". The Astrophysical Journal. 597 (2): L121–L124. arXiv:astro-ph/0306220. Bibcode:2003ApJ...597L.121E. doi:10.1086/380188. ^ Leong, Stacy (2002). "Period of the Sun's Orbit around the Galaxy (Cosmic Year)". The Physics Factbook. Retrieved 2 April 2007. ^ C. Barbieri (2003). "Elementi di Astronomia e Astrofisica per il Corso di Ingegneria Aerospaziale V settimana". IdealStars.com. Archived from the original on 14 May 2005. Retrieved 12 February 2007. ^ Reid, M.J.; Brunthaler, A. (2004). "The Proper Motion of Sagittarius A*". The Astrophysical Journal. 616 (2): 872–884. arXiv:astro-ph/0408107. Bibcode:2004ApJ...616..872R. doi:10.1086/424960. ^ a b c Leslie Mullen (18 May 2001). "Galactic Habitable Zones". Astrobiology Magazine. Retrieved 24 April 2015. ^ O. Gerhard (2011). "Pattern speeds in the Milky Way". Mem. S.A.It. Suppl. 18: 185. arXiv:1003.2489. Bibcode:2011MSAIS..18..185G. ^ "Supernova Explosion May Have Caused Mammoth Extinction". Physorg.com. 2005. Retrieved 2 February 2007. ^ "Our Local Galactic Neighborhood". NASA. 5 June 2013. Archived from the original on 21 November 2013. ^ "Near-Earth Supernovas". NASA. Archived from the original on 13 August 2006. Retrieved 23 July 2006. ^ Anglada-Escudé, Guillem; Amado, Pedro J.; Barnes, John; Berdiñas, Zaira M.; Butler, R. Paul; Coleman, Gavin A. L.; de la Cueva, Ignacio; Dreizler, Stefan; Endl, Michael; Giesers, Benjamin; Jeffers, Sandra V.; Jenkins, James S.; Jones, Hugh R. A.; Kiraga, Marcin; Kürster, Martin; López-González, Marίa J.; Marvin, Christopher J.; Morales, Nicolás; Morin, Julien; Nelson, Richard P.; Ortiz, José L.; Ofir, Aviv; Paardekooper, Sijme-Jan; Reiners, Ansgar; Rodríguez, Eloy; Rodrίguez-López, Cristina; Sarmiento, Luis F.; Strachan, John P.; Tsapras, Yiannis; Tuomi, Mikko; Zechmeister, Mathias (25 August 2016). "A terrestrial planet candidate in a temperate orbit around Proxima Centauri". Nature. 536 (7617): 437–440. arXiv:1609.03449. Bibcode:2016Natur.536..437A. doi:10.1038/nature19106. ISSN 0028-0836. PMID 27558064. ^ "Stars within 10 light years". SolStation. Retrieved 2 April 2007. ^ "Tau Ceti". SolStation. Retrieved 2 April 2007. "Solar System" . Encyclopædia Britannica. 25 (11th ed.). 1911. pp. 157–158.